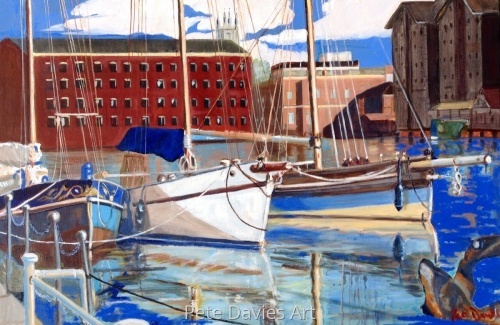 This is the second impression of Gloucester Cathedral. I found this slightly easier to paint than the other two, though it had its difficulties. As I painted the stained glass windows I was aware of how much work had gone into the images of the birds that feature in the windows. I wanted to convey the idea of light shining onto a romantic gothic darkness. 9.75" x 8"11" x 9"13.75" x 11.25"
I was in awe of the craftsmanship and form of light within Gloucester Cathedral. 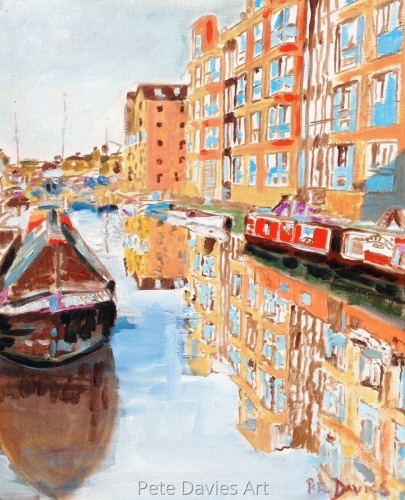 I wanted to reproduce this in paint but found it very difficult to reproduce the shapes and colours I had seen. 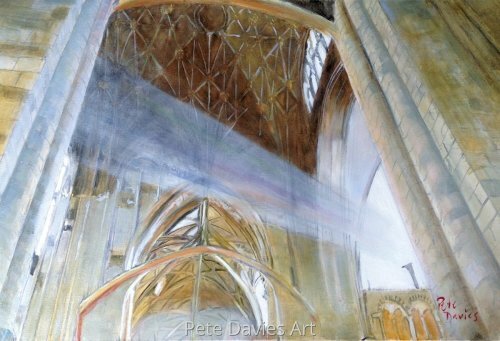 The beam of light moving from right to left is genuine and not an additional artistic touch. 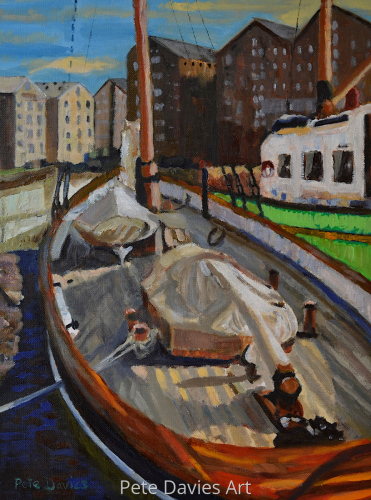 Although I painted the ceiling many times I am still aware of the many shortcomings in the painting. 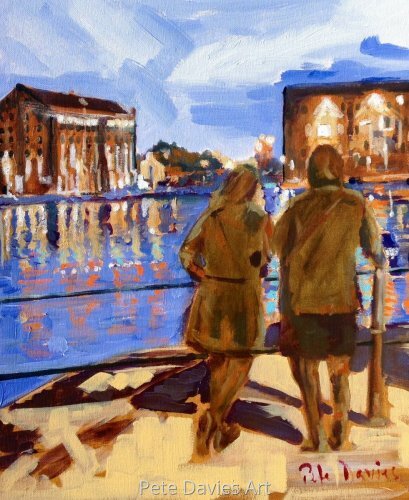 9" x 13.25"10.5" x 15.5"
Painted on board this shows two women looking out over the docks during the evening. I painted this for the reflections in the water and the contrast between the silhouette figures and the glimmer of an alluring night life. 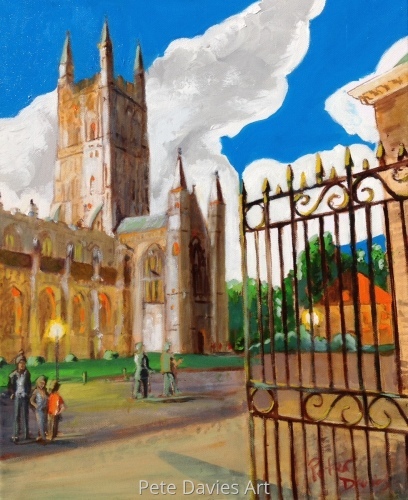 11" x 9"14" x 11.5"
A view of Gloucester Cathedral, the burial place of Edward II. Although not a deliberate attempt, this also reveals my interest in style of the travel posters of the 1930s. 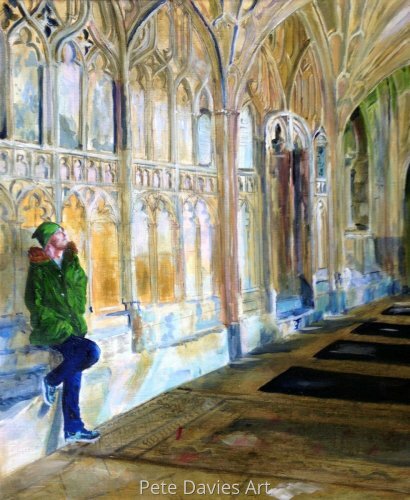 10" x 8"11" x 9"14.25" x 11.5"
This is a painting of the cloisters at Gloucester Cathedral. My son, John is leaning against the wall contemplating the architecture. 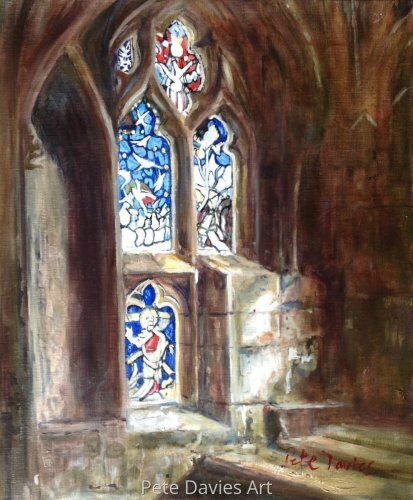 This was a complicated and difficult painting for me to produce, the Medieval carving was extremely complex and left me humbled and in awe of our forefathers' abilities. 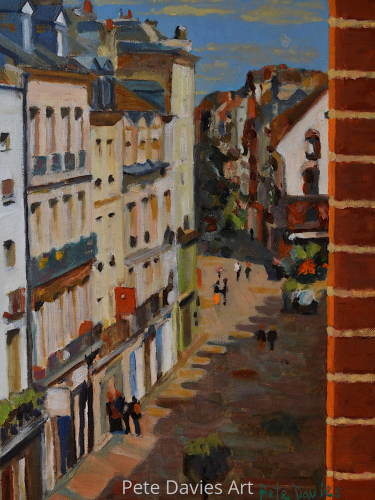 11" x 9"12.75" x 10.5"
This is an oil painting of the Café des Tribunaux in Dieppe, France, a café which was frequented by painters such as Monet and Sickert who painted the café in the 1890s. 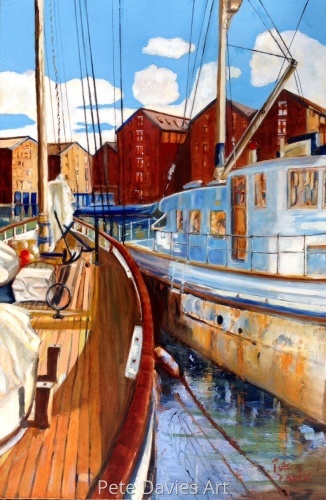 It is one of two paintings that I have completed in the impressionist style, the other is of two boats in Gloucester docks, also on this website. 14.75" x 11"17.25" x 13"22.25" x 16.75"